2 in 1 Hot Cake The Hotcake is designed to leave the undistorted component of the guitar sound unchanged, while providing a nice fat distortion sound without resorting to a treble cut circuit which will also affect the guitar tonality. With the Drive and Presence controls set to minimum, and the Level at around 2 o'clock, you should be hard pressed to hear any change in the sound at all when you switch the Hotcake in and out. You can get a clean volume boost by increasing the Level control. Increasing the Drive will give you a thick distortion sound with a little bit of edge to it, and the Presence control adds some mid-range punch to the sounds. The Hotcake also handles chords well. It is recommended that the Hotcake is patched between the guitar and amplifier, rather than into an amplifier's effect loop. 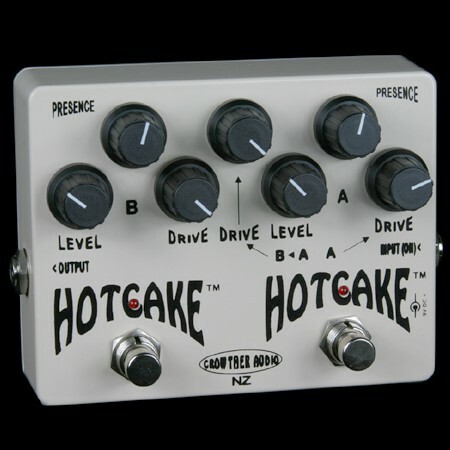 Generally speaking, if you are happy with your guitar and amplifier combination, the Hotcake will work well as a primary distortion.